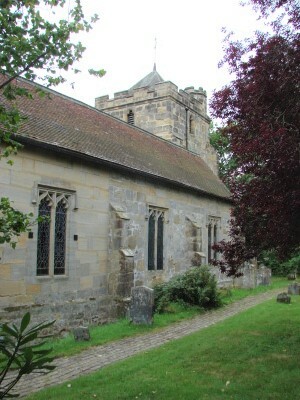 The north aisle is C14 and the tower early C15. The rest, including the south aisle and chancel, is C19. The C16 font-cover has opening doors. A small church is mentioned in Domesday Book (9, 122), but nothing in the present one at the upper end of the village is older than the C14. 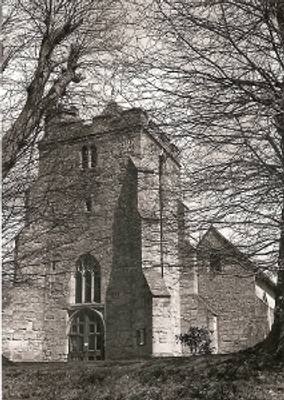 It is likely, however, that the shorter nave, in its form until the C19, kept its early dimensions if not some walling. 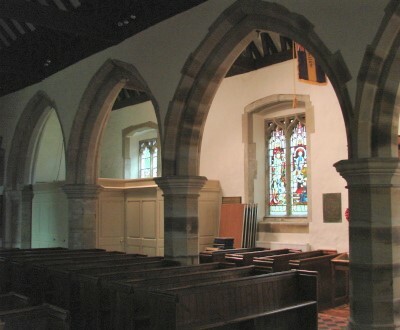 This is supported by Sir Stephen Glynne, probably in the 1820s, who saw (SNQ 16 (Nov 1967) p347) a low, plain Norman chancel arch as well as lancets in the chancel. 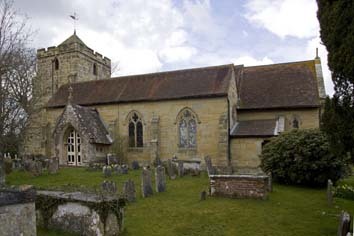 The pattern of a nave that was C11 or C12 with a chancel rebuilt or extended in the C13, is frequently found in Sussex. In the later C14 a broad, gabled north aisle was added, which is now the western part of a longer one. The two western bays of the north arcade are characteristic of the period, with octagonal piers and double-chamfered heads. The old part of the aisle has two-light square-headed north windows with pierced spandrels (one renewed) and the west wall was originally blank. The roof-ties are old. The squat early C15 west tower has diagonal buttresses and an octagonal stair. The sill of the west window of renewed panelled tracery rests directly on the square hoodmould of the doorway, which has plain spandrels. There is no reason for this, as the next stage is blank except for small rectangular openings. To the west is a plain double bell-opening and the other three are single and trefoiled. The top has battlements and a tiled pyramid and the tower arch is like the arcades, so it was started soon afterwards. The western part of the nave roof has C15 moulded timbers and the Sharpe Collection drawing (1797) shows the chancel was altered in the C15, with a three-light east window (reset in the present one) and south windows adapted from two-light square-headed ones. The same drawing shows a C17 or C18 south porch and dormers in the roof for one or more galleries. Timbers from the west one were reused in the roofs of the C19 eastward extensions of the nave and north aisle, including a large beam with egg and dart moulding, dated 1632 (1 p103). This is likely to be connected with the gallery of that year, of which there are other fragments in benches at the west end (see below). There was also a four-centred opening in the gable of the north aisle which was clearly for a gallery and was probably of this date. In 1836 there was an application to the ICBS for a new south aisle. The plans were signed by W Inskipp, described as a surveyor. It is doubtful whether this was ever built, though the ICBS made a grant. Tenders for the restoration by A S Newman and A Billing were sought in 1866 (B 24 (14 July 1866) p ii), and it was completed the next year (ibid 25 p596). 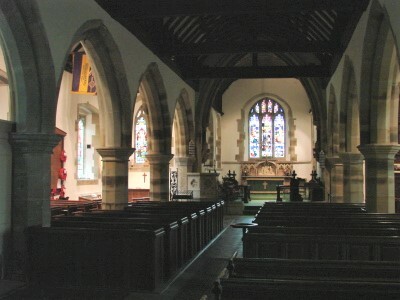 The chancel was demolished and the nave extended over the site, with two new bays of the arcade, which copied the C14 ones and a re-used east respond. The present south aisle is all of a piece with the rest of the work at this time, so if one had been added in 1836, it was now thoroughly rebuilt or remodelled. The arcade resembles the north one and the windows to the south are pointed. There is a stone porch. The new chancel arch has a heavy head on semi-circular marble shafts on angel-corbels. The chancel is lavishly fitted. The suggestion of the VCH (9 p279) that the walls are built on the footings of the old chancel is impossible as the extended nave is significantly wider. The windows are copied from the old ones, save for the trefoiled side-lancets; the C15 east window was reset. Benches: (West end) Three contain C17 panels, said to come from the west gallery of 1632 (1 ibid). Font: Plain and octagonal and C15 or C16. 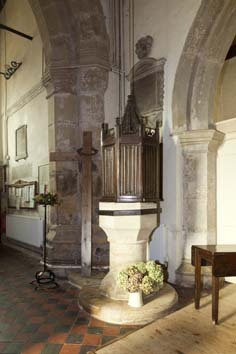 Font cover: One of three polygonal ones with opening doors in Sussex. That at Rotherfield can be dated precisely to 1533 and this is of similar date, though Bond (p289) thought it early C17. Between each linenfold panel is a finial connected by open tracery. In addition to the doors, the whole cover can be lifted by a pulley. Funerary helm: (over south doorway) Probably not older than the C17 and said to have belonged to Sir Thomas Sackville (d1692), to whom there is a memorial tablet now in the vestry (Mitchell/Shell Guide p167). In place of the customary plume on top is the head of a goat. 2. (Chancel, north and south side windows) C E Kempe, 1890. 3. 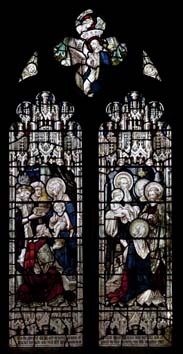 (South aisle, second window) A J Dix, 1902 (signed). 4. 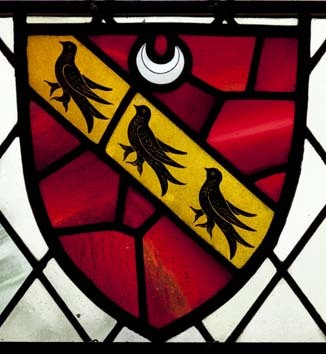 (South aisle, third window) R O Bell, presumably made by Clayton and Bell, 1930. two lights of heraldic glass (www.stainedglassrecords.org, retrieved on 15/2/2015). 5. (North aisle, first window) Two figures of saints. A Wright, 2002 (Artist’s website). 1. (North aisle west wall, now hidden by the vestry partitions) Colonel Thomas Sackvill (d1692). His arms are contained in a cartouche above the rounded pediment. 2. (North aisle floor) Iron tomb-slab of Thomas Bisshopp, who died in 1664. As other members of his family are also named, the latest of whom died in 1669, the slab must have been cast after that. 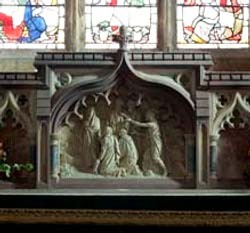 Reredos: Carved figures beneath an ogee-headed arch, dating probably from the reconstruction of the chancel in 1866-67. 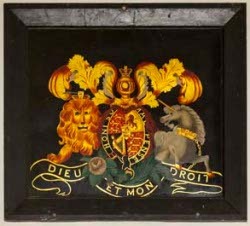 Royal Arms: George III, painted panel. Screen: Low and of iron, probably dating from 1866. 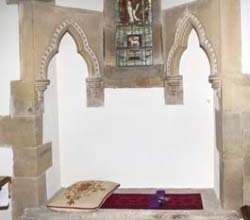 Sedilia: (South chancel window sill) This appears C19 with trefoiled squinches and dogtooth. Though said in 1867 to be original (B 25 ibid), this is at best a facsimile. Furthermore, it is not mentioned by Glynne, who might be expected to have noted it. My thanks to Nick Wiseman for most of the above photographs.